The ES1000 Ultra Portable Tabletop Projection Screen is the ultimate screen for mobile professionals. 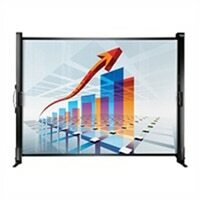 Whether you're walking across town, commuting by car or flying to your next destination, this lightweight, compact screen is the perfect traveling partner for on-the-go presentations. When you're ready to present, the ES1000's unique one-piece design allows you to set up quickly and easily on any tabletop in less than 30 seconds. It conveniently accommodates up to a 50-inch image.